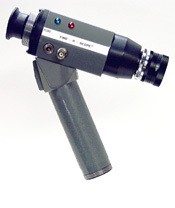 The FIND-R-SCOPE 89400 is a self-contained, hand-held Infrared Viewer with a spectral sensitivity of 400-1250 nm, and NTSC format video output. Note: The 89400 is currently unavailable. Please contact FJW for replacement options.